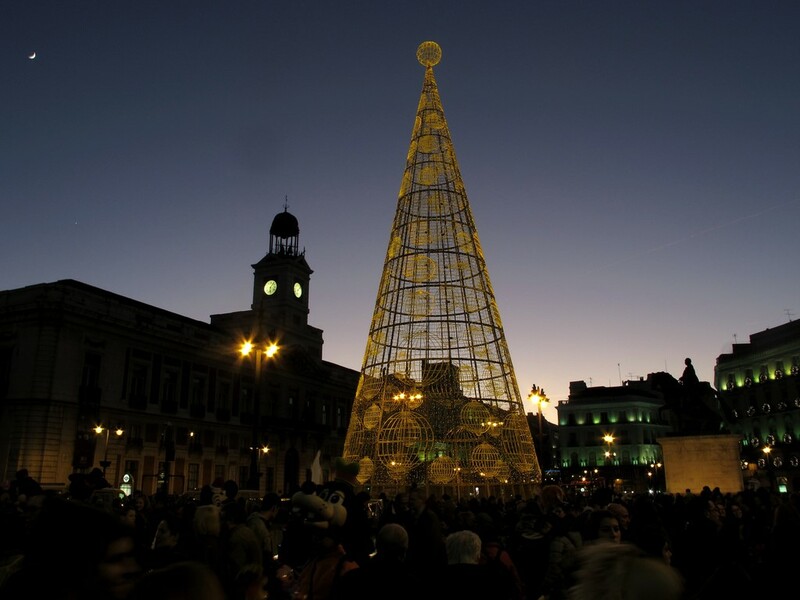 In a few weeks I will be going home to Murcia, Spain for Christmas – just in time to celebrate Christmas Eve. I have however missed one of my favourite things to do with my family: decorating the house. At home, we usually put the Christmas tree in the middle of the living room and decorate it with Christmas decorations: baubles, mistletoe, a wreath, and the all-important Christmas star. In the main entrance we have the nativity scene, accompanied with Christmas lights all over the house! A common Spanish decoration is the poinsettia flower, also known as the Christmas flower or Santa Claus flower because of its characteristic intense red colour. My father always gives it as a present to my mother for their wedding anniversary on the 8th of December, the Feast of the Immaculate Conception (a Spanish national holiday). I love going out for a walk with my family and friends to see the streets; fully illuminated with different colour lights, and that unmistakable aroma of roasted chestnuts and churros with chocolate that floods the streets. It’s very typical to find hot chestnut carts, where the chestnuts are roasted in a pot by the warmth of the embers of a fire, and eating them out of a newspaper wrapping whilst almost burning your hands and getting your fingers black from the soot. And, well, what can I say about the churros with hot chocolate? It’s the best combination ever! In addition, the tradition of pedir el Aguinaldo remains, which consists of going from house to house singing Christmas carols in exchange for some sweets or spare change. You can always find a group of children singing Christmas carols accompanied by tambourines and zambomba drums. Another Spanish Christmas tradition is the Sorteo extraordinario de lotería de Navidad (Spanish Christmas National Lottery), which takes place on the 22nd of December in the salón de Loterías y Apuestas del Estado (publish business entity that belongs to the Spanish Ministry of Finance and Public Administrations) in Madrid. The first prize is known as el Gordo de Navidad. 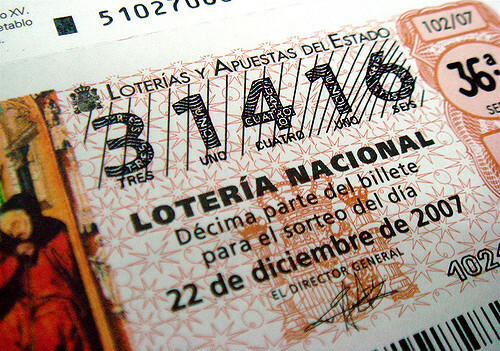 One of the representative places in Madrid is Doña Manolita, which is the most famous lottery administration in the country. The queues for buying lottery tickets can seem endless. On the 24th of December we celebrate Christmas Eve with family and friends. Our family tradition is usually to eat suckling lamb or roast suckling pig, always a success and very typical for this special night. Then we toast with cava or champagne. Following dinner, the table is filled up with nougat, marzipan and chocolates, and we all gather around to sing Christmas songs together. For me, the absolute best part of Christmas is spending time with your loved ones. At 12:00am the Misa del gallo is celebrated, right at the beginning of Christmas Day, to commemorate the birth of Jesus. On Christmas Day, again families join together to have lunch. In my family it has long been tradition that my grandmother cooks cocido con pelotas (typical Spanish stew), but it is different in other families, I guess. It’s not very common in Spain to celebrate the arrival of Santa Claus and his reindeer, but we have always done it, ever since I was little. The next morning, I wake up and go straight to see the presents under the Christmas tree! The 31st of December is New Years Eve, last night of the year. It is typical for families to come together join to have dinner together and then to go out with friends and party all night long. My family and I usually have dinner lombardy as the first course, followed by baked fish for mains. At midnight, we eat the Twelve Grapes (Las doce uvas de la suerte or “The Twelve Grapes of Luck”), which is a Hispanic Christmas tradition that consists of eating a grape with each bell strike at midnight. According to the tradition, if you eat all the grapes, you will have a prosperous new year. The striking of the bells is broadcast on TV (the official ones come live from Puerta del Sol in Madrid) and then we toast with cava or champagne to see in the New Year. From then on, the city is full of people celebrating the New Year, and the party lasts until the sun comes up. In my group of friends, we have the tradition of having churros with hot chocolate for breakfast after the party. And of course, going out on New Year’s Eve for one last lunch with the family is an absolute must! The 5th of January is a special night for children because it celebrates the arrival of the Three Magi (or “Three Kings”). 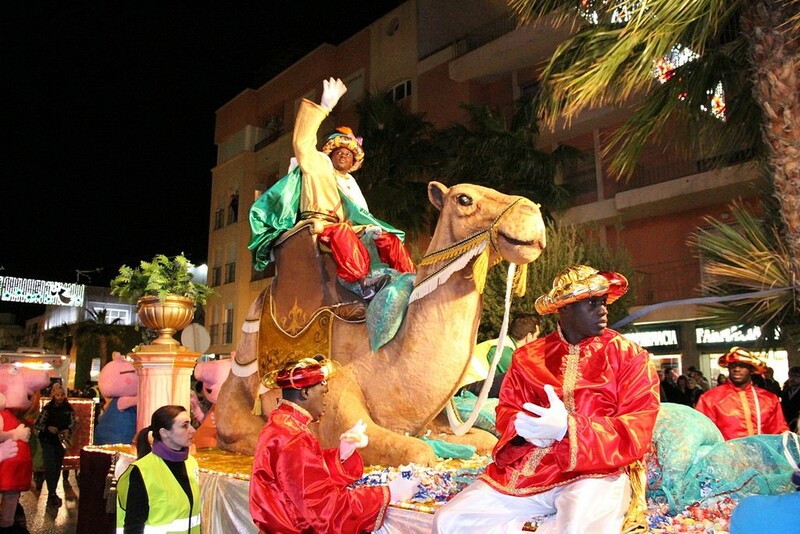 It is common to go out and see the Cavalcade of Magi (traditional parade of kings’ coaches) and get candies from their page boys. The Three Magi come from the East, guided by the Star of Bethlehem (or “Christmas Star”). They have received the letters of children asking them for presents, and, depending if the kids have been good or bad during the year, they will bring presents or coal. The next day, all the presents are under the Christmas tree and the typical sweet to eat that day is roscón de reyes (Kings’ ring or Kings’ cake), a cake decorated with dried and candied fruits. On the inside it has a bean and a figurine. Whoever finds the figurine wins, but the one who finds the bean will have to pay for next year’s roscón. We usually eat this cake with hot chocolate. As you can see, we are deeply in love with the Christmas season in Spain. Christmas is a time to be with family and to share happy moments with them. It’s time to celebrate and to remember that the most important thing we have in life is our loved ones.